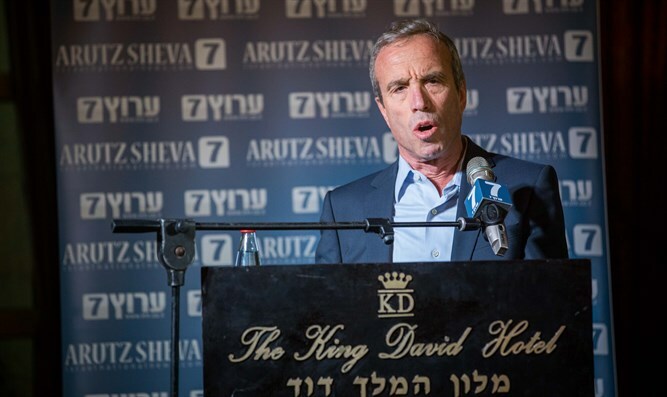 MK Elazar Stern speaks to the "Salute to Jerusalem" Arutz Sheva Conference organized by Dr Joe Frager. MK Elazar Stern (Yesh Atid) noted the wide agreement within Israel over President Trump's decision to move the US Embassy from Tel Aviv to Jerusalem. "To move the embassy to Jerusalem, there is no coalition or opposition in Israel," Stern told the "Salute to Jerusalem" Arutz Sheva Conference on Tuesday. "There is a very wide agreement." According to Stern, "We don't need Trump or Ambassador (David) Friedman to give us evidence that Jerusalem is our capital. Every Jewish person all over the world, it doesn't matter New York, Sydney, Johannesburg, everyone prays to Jerusalem." A former Major General in the IDF, Stern recalled how he instituted a program that brought every single IDF soldier to Jerusalem's City of David when he commanded the Education Corps. "I was attacked in Israel because it wasn't under consensus," recalled Stern. "I hope that after hundreds of thousands of soldiers visited the City of David, it changed their feelings towards Jerusalem." Stern added that moving the embassy to Jerusalem wasn't just important for world recognition, but to remind Israelis of the importance that Jews have always given to the city of Jerusalem for thousands of years. "To me, there is no doubt that moving the embassy to Jerusalem is also important to our next generation. It's important to know that Jerusalem was, is, and will always be our capital," Stern proclaimed.